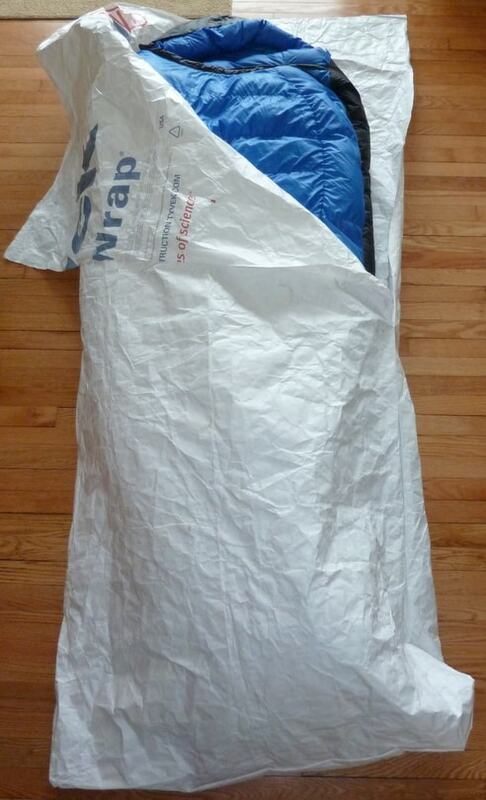 Tyvek is breathable so your body ought not saturate your sleeping bag so long as you don’t overheat. The fact that it cuts any cold draughts and ought to reflect some of your body heat back at you should also mean that it will substitute for a sleeping bag thermal liner (taking your bag down probably another 5C), and it WILL keep you dry. If you configure it as a poncho as well (http://www.theultralighthiker.com/hole-less-ponchoshelter/) , it should also cut down your pack weight by replacing at least these three items for an overall weight of approx 200 grams. Given that you would have had an approx 100 gram groundsheet anyway, plus an approx 200 gram thermal liner and at least 150 gram raincoat, you should be saving about 250 grams! In an emergency you could no doubt sleep in it right out in the rain! You might carry it in your daypack along with your lightweight sleeping bag with this eventuality in mind! You will have to configure the zippers in such a way they do double duty. There will be two 3’6” zips which will become the chest zip of the poncho; the shorter zips will do double duty as the arm closures. When you go to lay it out you will see how many (separating) zips you need and which way/s they have to run.